The Seahawks will trade down from #21. We all know that. It’s very difficult to project a trade (we had to do it for a full draft season last year). I’m going to offer the same proposal here that was involved in our latest mock draft. It’s a deal with Buffalo. Ultimately the team, the terms and the scenario don’t matter. Really this is just an exercise to fill out Seattle’s board for a projection. In our last mock we had Buffalo trading down in round one (going from #9 to #12). They acquired a third round pick. This gave the Bills two picks in the third, fourth and fifth round. It seems ample stock to try and trade back into round one to try and build around young quarterback Josh Allen. So we had them trade from #40 up to #21 for Jonah Williams. The Seahawks, for moving down 19 spots, receive a third, fourth and fifth round pick. I have no idea whether this is realistic or not. The Seahawks might not want to trade down that far in one go. The Bills might not want to aggressively trade back into round one. It’s difficult to make sense of what could happen — especially this early in the process. For now, this is what I’m going with. If something like this did happen, it’s possible the Seahawks could trade down again from #40. This feels like a draft with some day three value. With Pete Carroll emphasising a desire for competition rather than any specific positional need, collecting day three picks seems like a realistic target. At this point it’s also worth remembering the Seahawks only have 47 players contracted in 2019. Only three teams have fewer and that includes the Los Angeles Rams (who are yet to sign anyone to a futures contract because their season is yet to be completed). While some are suggesting the Seahawks can make a significant free agent splurge — the reality is they have to prioritise retaining their own, find a solution to the Wilson/Wagner/Reed/Clark dilemma and fill out their roster. There’s not enough money to do all of those things and add a $15-20m free agent. They’re going to need to look for value and let free agency come to them. It also means they’re going to need a decent collection of draft picks. Thus, the potential to trade down more than once. It’s probably not the most exciting thing to consider for fans. Some will want a splash. They want to see a couple of big names added, believing it could push Seattle ‘over the top’. The Seahawks already have most of the pieces to contend. They need some of their younger players to take a big step forward in 2019, they need greater depth on both sides of the ball and they need competition. If Anthony Barr’s market is chilly when free agency begins — that could be an opportunity to repeat the Bennett/Avril heist of 2013. Aside from any prospective moves like that, the biggest free agent acquisition they might make is a quality kicker. And who would argue with that? Their one ‘splurge’ could be to sign Stephen Gostkowski away from the Patriots. It could be to go and get Robbie Gould from the Niners. They’ve had three inconsistent years of kicking. It’s time to sort that out. Anyway, back to the mock. It’s a post-Senior Bowl projection so it’s heavily influenced by what happened in Mobile (and to a lesser extent, the Shrine Game). The combine will change things of course. We’ll do another seven-rounder after that to see how things have changed. I firmly believe the Seahawks will target and draft a quarterback this year. We’ve gone over the reasons why, relating to Russell Wilson’s contract. Why Grier? I wrote a more detailed explanation here. He was the best deep-ball thrower in college football for the last two years and specialises in explosive pass-plays on go-routes. He elevated West Virginia and led them to significant wins (eg Texas on the road). John Schneider attended the Oklahoma vs West Virginia game in person. It’s possible Grier could be available in round three. It’s possible they could trade down again from this spot and land him later in round two. Regardless, I believe they will strongly consider drafting a quarterback early. I like everything about Khalen Saunders. He dominated at a small-school level. He’s strong enough to toss linemen to the ground, he controls the POA, he can shoot gaps with quickness and swim/rip to the backfield. You see him working down the line to stretch out runs and he even took some snaps at DE. He can do back-flips at over 300lbs. He’s a sensational athlete with massive potential and great character. He was a ‘wow’ performer at the Senior Bowl. The only thing that makes me pause is arm length. The Seahawks nearly always draft defensive linemen with +33 inch arms and Saunders’ are listed at 32 3/8 inches. The short shuttle will be big for for him. If he runs it in the 4.5’s — that’s Seattle’s ball-park. Collier is a fantastic prospect. I’d bang the table for him. He stood out at the Senior Bowl. Right off the bat in practise #1 he drove Dalton Risner to the turf and it set the tone for a fantastic week. He won with a bull rush, won with a speed rush. He used hand-technique to disengage, he extends his arms to keep his frame clean, he converted speed-to-power and showed a good dip and bend to attack the edge. On tape he consistently found a way to make splash plays. In the Bowl game against California he had this one play where he absorbed a double team then just powered his way through both blockers to hammer the running back for a four-yard loss on a stretch run. He has nearly 35-inch arms and an 81 1/4 inch wingspan which is freaky length for a 6-2 lineman. We’ll need to see how he tests at the combine but if the Seahawks can’t get a pass rusher with their first pick — Collier could be a great alternative here. Last month Tony Pauline reported the Seahawks had interest in Peters. He has 33 1/8 inch arms and he’s 6-2 and 217lbs. He looks like a big, physical cornerback and his play matches the profile. He struggled for turnovers in college and it’s what likely keeps him on the board. He needs to learn to track the ball and find ways to impact games. That said, he’s a tough tackler and is willing to lay a hit. The Seahawks are likely to add a cornerback to the competition on day three. Sample had such a good Senior Bowl he might not actually last this far. He did everything well. In catching drills he showed an ability to get open over the middle. I didn’t see him drop a pass in any practise session. In the blocking drills the Raiders had the TE’s block on an island and he even excelled there which was extremely impressive. The Seahawks could do with adding a tight end with Will Dissly returning from injury and Nick Vannett one year away from free agency. Hodge put up huge numbers at Buffalo, collecting hundreds of tackles. He’s not a dynamic athlete capable of making rangy plays in coverage. However, he fills gaps well in the running game and can sprint to the sideline to lay a hit. There’s untapped potential with Hodge who has the kind of grit and leadership Seattle has targeted regularly. Tony Pauline reported at the Shrine Game that many in the league believe the Seahawks really like Hodge. Seattle’s offense is set up to feature a full back. They spent most of last season without one. They could put that right in 2019. There aren’t many orthodox full backs in college football but Ingold fits the bill. He’s exactly what you want from the position. He’s physical, he’s effective in short yardage situations, he has decent hands and special teams value. He had one crack-back block in the Senior Bowl that had Jon Gruden marching onto the field to give him a high-five. It won’t be a surprise if the Seahawks go after Ingold. Depth and competition at key areas on the defense — pass rush, defensive tackle, linebacker and cornerback. You’re getting day three value on offense with a tight end and full back who should be able to contribute quickly. The first pick isn’t an ‘impact’ player but it could be a vital addition considering Russell Wilson’s contract situation. We’ve talked a lot about Montez Sweat (EDGE), T.J. Hockenson (TE) and Kyler Murray (QB). Currently I’m not expecting any of those players to be available if Seattle trades down. Hockenson and Murray probably won’t make it to pick #21 let alone round two. Parris Campbell (WR) and Andre Dillard (T) could also be gone. We’ll see on Terry McLaurin (WR) too. I think at least 12 defensive linemen and two linebackers will go in round one. The Seahawks appear set to lose K.J. Wright in free agency (he will get paid) and the future is unclear for Mychael Kendricks. Even if Kendricks avoids jail and is re-signed, they could do with more depth at the position. New Mexico State linebacker Terrill Hanks has an 80 1/2 inch wingspan and similar length to Wright. He had a terrific Senior Bowl with many comparing his performance to that of Darius Leonard a year ago. Hanks will need to prove he has the agility and speed for the next level at the combine. If he achieves that he could be an option for the Seahawks in round two. Renell Wren is 6-4, 315lbs and reportedly runs a 4.85 and jumps a 34.5 inch vertical. He can also bench 430lbs and squat 600lbs. There aren’t many humans like Wren. He’s built like a tank. You’re always going to pay attention to an athlete like that. He’s being touted as a second or third round pick. Chuma Edoga (T, USC) was outstanding at the Senior Bowl at left tackle and could be added to provide some quality tackle depth and long term security. He really looked the part in Mobile. Lonnie Johnson (CB, Kentucky) had an impressive Senior Bowl and has the size (6-2, 220lbs) and arm length (32 1/4 inch arms) that the Seahawks like. Jim Nagy described Marquise Blair (S, Utah) as a ‘Seahawks’ type safety. He’s quick and hits like an absolute hammer. He might be a late round or UDFA target. Seattle reportedly took an interest in Terry Godwin (WR, Georgia) at the Shrine Game. He’s a former four-star recruit with a lot of potential. Chris Lindstrom (G, Boston College) and Kalen McGary (T, Washington) both really impressed in Mobile. Both players are tough and physical with great attitude. Ben Powers (G, Oklahoma) showed well last week as did Bobby Okereke (LB, Stanford), Charles Omenihu (DE, Texas) and Byron Cowart (DE, Maryland). If it worked out that would be a pretty good haul. I actually wondered whether it was too much. Are people happy with the regular content or would you like to let pieces breathe? Are you keeping up with all the articles? I’d be very interested to know what the community thinks/wants. Seattle Sounders 2 has rebranded to Tacoma Defiance FC. With a crop of very talented youngsters, they’ll be a pleasure to watch grow and I’m hugely excited for the future of soccer in the South Sound. Long time lurker, first time commenter. Love the content you crank out and it always leaves me wanting more. I think the way you do it now is just fine. Sometimes pieces need to breathe and sometimes it calls for a quick follow up. I think you have good judgement on what the timeframe should be for your pieces. Keep it up good sir! I post rarely but read all the time. Love the content and the pace. Love this seven round mock. I really like all the content. Your writing is top notch. I especially enjoy your prospect evaluation. You kill it considering you don’t have a scouting background. Appreciate the blog this past month in particular while I’ve battled staying sober. Sorry if I’ve gotten carried away with a couple topics. One day at a time Eburgz. Don’t fight the storm, Be the storm! I really enjoy reading your new content, but I think you should let your articles breath for two days. I enjoy reading the comments and different thoughts from everyone on here. IMO if you pump out too much content then the banter between the readers will get lost in archives and may be a deterrent for readers to leave comments. Let your work articles breath so everyone can discuss and debate the topic for two days. Love the content and the pace. This is the only site where read all of the content and all of the comments as well. Great work. Wish we could make enough noise as Seahawk fans so as to get Pete Carroll and JS to grant you interviews!!! Keep cranking them out my man! I will keep reading. You da man! I agree. Keep ’em coming, Rob. This is our Hot Stove League and the time of years where you shine your brightest, and we can’t get enough. The draft is your wheelhouse Rob, so the number of articles doesn’t seem like too much to me. Things will take a momentary breather after the combine and first wave of FA, so a slight decline in the number of articles seems logical then. On a personal note, I’m really excited for this draft and the chance the Hawks have to build on the culture Pete and John reestablished in 2018. They know who they are for the first time since probably 2014, and have buy in once again from young players and vets. A solid draft mixed with a smart FA period could really help the Hawks compete for the division again in 2019. Go Hawks!!! I do not post a lot but it has been years since i missed a word you said. Usually, “regular content” implies some lesser quality material but it has never been the case here. As long as you can keep feeding us this quality of content, the more the merrier. Carry on the fantastic work you have been doing for years. I know it might be a bigger project but after the combine maybe could you put together a piece with listing all the potential guys for the Hawks by position and the info about where do you think they’ll go? (like: WR – McLaurin (late first), Campbell (early second), Deebo (early second), etc)? Absolutely. I’ll compile a list of potential targets and the range they might be available. Hey Rob what are your thoughts on Nasir Adderley? Do you see him as a solid fit with the Hawks and what range do you expect him to be drafted? Thanks! Rob, that would be awesome! Thank you again and again for continuing this sane discussion during the offseason and who might be a good fit in our system. I check your site everyday and can’t keep up. The folks on here that respond are also thinking about it and I look forward to reading their comments as well. This is such a great site and a place for us to think about the possibilities. I don’t always agree but I respect the opinions here. Thank you, Rob, for giving us this. When you make that list I would be curious to see what you think of Emmanuel Butler from Northern Arizona. I know he’s a small school guy, so he hasn’t seen the level of competition that some have, but he really looks the part to my untrained eyes. It is definetly not too much. I check the blog several times every day, and read every word you write. This is my number one draft source. I am super impressed with both the debth of you analysis and how much content you are able to write. I have no idea have you have enough time for a job, family and the blog. Keep the content coming, but don’t forget about the family. By all means keep the articles coming Rob! I’m saddened when we have to go more than a couple days between new material. It is draft and free agency season after all, and trying to put the pieces together for the next Seahawks Super Bowl team is crazy fun! Not only are your articles superb, well thought out, and realistic, the reader comments are very insightful and fun to read and participate in. Can’t wait for a detailed Seahawks free agency evaluation, as this will be very key to 2019 success. My 2 cents, I like an article every other day. I would love something new every day – but I’m afraid you would get burned out. Daily is probably more appropriate around events like the Senior Bowl, Combine, and Draft. Also – in past years you have sometimes spent a lot of energy defending or arguing something in the comments. Too much energy in my opinion. The readers can debate amongst themselves with a few of your comments sprinkled in. I would rather your energy is concentrated on the next blog. The amount of comments you have given lately has been about right. I can’t get enough of your content Rob, keep cranking it out please! What are your thoughts on WR Deebo and if you think the Hawks will target him and if so where? Love the content. Thanks for all your hard work! Given the nature of the content of your blog, centered around the draft, I’ve come to expect periods of higher volume (now through the draft) and periods when you “go dark.” Keep the articles coming! Loving the articles, check the site multiple times a day for new articles or your posts. Bringing Russell’s contract and the corresponding maneuvers by management has been enlightening to say the least. What a time to only have 4 picks!! Echo Frontrower. I greatly enjoy each article for any number of reasons. Primary is learning more about this year’s draft class members and which of them the ‘Hawks might consider. It’s also nice reading comments from posters, most of which are positive. I’ve long tired of articles and posts excoriating players and coaches. As Oliver would say, ‘Please sir, I want some more’. I am want Drew Lewis to be a Seahawks. He has the pedigree and he’s a freak athlete. Preston Williams is very very good, John Schneider personally scouted Colorado State. What would it take to crowdsource a trip for Rob to the Combine? I’d be happy to chip in! I so love that idea. Someone make it happen, I’m in!! The NFL should just wise up and have Rob cover the combine for EU audience. I mean, Mayock is gone, Rob has a very solid folder/resume from all the podcast work, and the NFL always wants to expand it’s audience. Perhaps the league has looked into it. Perhaps league execs don’t think it would have an EU audience. I wonder if the combine is covered there at all. If it is, it makes sense to have it covered by someone with local (EU) ties. Unfortunately the NFL thinks that people who have had ties to the league as a scout, player, coach, etc. somehow make better commentators. I think giving someone lime Rob a chance could turn out to be a brilliant move. You can get as good or better coverage watching the NFL network from a comfy chair with your favorite adult beverage… and marvel at the Underwear Olympics! If it were me…. I’d greatly prefer a week at the Senior Bowl in Mobile. That’s where guys really get to compete. Let’s see if we can get Rob booked early for next year! Rob, have you gotten the chance to look at Ryan Finley from N.C. State? He seems like a QB to pick maybe a round or two later rather than picking Will Grier early. Not yet. I’ve had an extensive look at Murray, Grier and Stidham. Finley probably next. 1st post. Never too much! Read and check all day. In for $$ to send to combine. The scuttlebutt on the John Clayton show surrounded the Rams being a 1 and done after this SB… since they are going to be losing a decent amount of talent and it is questionable if they can fill all the holes at CB and S that they might have headed into the 2019 season. This wouldn’t be effected by a win or loss in the actual game, however a loss would be devastating. In all honesty, 2 or 3 guys mentioned are highly likely to land in Seattle. And, where the heck is the 2019 kicker …. from the draft ????? There is a punter at Utah that has a similar skill set to Dickson, so I’m wondering if you could just draft that guy, then do drop kick field goals instead. It’s pretty unlikely for Dickson to be the kicker, but imagine the value it would bring?! Saving a few million on a top flight FA kicker would help a little, but would disappear once he entered second contract. But the extra spot on the 53 man roster, and game day roster would be incredible for any team that could pull it off. When Seabass went down v Dallas, RW was holding practice field goals for Dickson. According to Twitter, he only made 1 of 4 and missed badly. Why is this odd to me – it’s not that difficult and he has one of the best legs in the world. I’ll bet he’ll be practicing those in the offseason. I like the new content daily. As long as the articles have substance, I think most of us will find a way to keep up. The 47 contracted players is no joke. Draft picks from the 2nd round back are the only way to balance out the big salaries for Wilson, Wags, Clark, etc. It’s another reason to trade out of the first round. Penny is going to cost us 3.4 million his final year (2021), compared to Carson costing us 750,000 his final year (2020). That’s where the value is at. On the other hand, if Frank Clark had been a first rounder, we wouldn’t be discussing whether he is worth 10 million or 15 million dollars year. Kind of makes the 3.4 million for a fifth year look cheap. Great job Rob! I think the more talk/content about all the draft possibilities for the Hawks the better. I like this version of your mock draft. The one change I would make is the 2nd Rnd pick of a QB. I think the Hawks will wait to see how this year of negotiation goes with Russell before they go the step of drafting a QB that high. They need to address the issue of losing Baldwin to retirement/injury. Their passing efficiency was not the same without Baldwin on the field. I think Whiteside from Standford would be a great fit for the Hawks. He is used to being on a run first team and knows how important completions are when the ball comes his way. He has the size to be that redzone threat missing now. I agree Ceasar, I like considering the QB that high as an option but I think there’s a lot of merit to them punting on the position again considering the lack of good QB’s in this class (compared to what’s looking like some pretty stacked classes the next two years) and the lack of picks that they have in this class. I also completely agree on the WR position, we really need to add more depth and it seems like there’s a lot of interesting depth in this draft class, I feel like it’d be a waste not to take advantage of the depth especially given how weak the last few WR classes have been. I think more quarterbacks come off the board in R1 than you mocked in your last post. Dolphins, Bengals, Chargers, Pats, Bucs, Steelers, Jags all need answers at QB. I don’t think any except Murray are worthy of the 1st round, but just as every year, teams reach for the best available at the position. I don’t know that ‘that guy’ will be there when JSPC pick to put fear in Wilson and Rodgers. If they don’t have the caliber of player to do it, you might as well take best available at D line. Is Grier good enough anyway? Or would Wilson and Rodgers grin and call our bluff? I’m really not trying to be downer, but I have my doubts this scenario plays out in our favor. Realistically, Wilson will demand a contract that breaks the back of this team – crippling it from retaining other core players. Giving a contract of that size to a player who has seen his best years will come back to haunt this team as he regresses further.. I’m ok with $32 mil a year, but Wilson will want MORE than $42 mil and much of it guaranteed. I actually liked Grudens decision to tear down the raiders and agree with rob they’ll trade Carr. If you know change is imminent, embrace it and lean in so new growth can emerge sooner than later. The Mariners embraced this philosophy too. Gruden will build his team the way he wants it. Nothing is guaranteed to pan out for him, but I’d be willing to wadger his chances are better than trying to make shoes fit that aren’t his. I’ve seen on various sites that the Hawks have met with certain players. Walterfootball claims the Hawks met with Nasir Adderley, Andre Dillard and Jalen Jelks, the DE out of Oregon at the Senior Bowl. I also saw they met with Old Dominion big WR Jon Duhart, a teammate of DE Oshane Ximines. I know you’ve touched on Adderley and Dillard. Anything yet on Jelks? I’d be interested to have you look a Duhart as well. (Or maybe they are fishing for information on Ximines.) Thanks for all the great content and I love the comments section as well. UO fan Jalen Jelks best work will come at the next level. I wasn’t impressed with Jelks. He looked tentative on tape. Doesn’t attack the tackle quickly enough — either to try and win with speed off the edge or just get on with a bull rush. Neither did I see a lot of twitch. He looks undersized too. It was hard to shake watching him be handled by a Stanford TE on a basic edge rush. I like this mock. Not a fan at picking Grier with the first pick, but I understand it’s a need because of Wilson’s situation. If a miracle would happen and we could sign an extension with Russ before the draft, it would be even cooler. Especially if we could draft Deebo or some other good receiver. Thanks for all the feedback on how regular you’d like articles publishing. I just wanted to make sure people weren’t struggling to keep up. Times have obviously changed in the last 10 years. Nowadays a lot of draft writers simply post thoughts on Twitter. It’s quite rare that a detailed article is written on a website and actually linked to. Most of the conversation and analysis comes in short 220 word bursts, sometimes complimented with a video. I do sometimes wonder if in 2019 people have the appetite to regularly visit a website to see if new content is available. We’re used to receiving content differently. It’s delivered, to an extent, on a timeline. And while in 2010-2012 I think people were quite happy to instinctively visit a website every day to see the latest piece — I’m not sure that’s quite as common nowadays. I do think there’s a major value to articles vs tweets though. On twitter it’s too easy to write what pops into your head, fire a post and then 2 hours later maybe you wish you hadn’t bothered or you’ve realised you were mistaken. Crafting an article takes time, effort and thought. Quite often I start writing a piece with a certain angle in mind and half-way through the sheer process of compiling the article has taken me in a different direction. Twitter has created a ‘tweet before you think’ process instead. But it’s popular. So I’m very interested to know what people want going forward. How you want this blog and this community to be represented. And I’d like to know what you want from this draft season. I have already booked time off work for the live combine blogs and also the end-of-day review. I’m planning to try and do some form of a podcast — which would include a 10-15 minute interview with two different draft/NFL experts or people of interest per podcast. My target is to do at least four or five of these podcasts before the draft. It might be a case of doing a month series with one appearing every week. If anyone has any other ideas or requests I’d be very happy to hear what you think. And thank you to you all for continuing to read and humouring a British bloke who loves the Seahawks and the draft. I absolutely check this website everyday, and based off how quickly these posts get 50-100 comments I’d wager I’m not the only one. So I wouldn’t worry on that front, keep them coming. Regular podcast sounds amazing, I’ll listen to anything Seahawks related, even the hawkblogger podcast which is awful, and I’m especially excited when I see that you’re appearing on one. Love all the tremendous content Rob. Like H and almost everyone else, check this site every day a few times a day. You’re second only to my e-mail as the site I check the most throughout the day or week. Sometimes check other sites like Seahawkers or Pedestrian podcasts just to see if you’re guesting on there. Great mock and love all the picks, especially the D picks Saunders and Collier. Heard on an Eagles Senior Bowl recap podcast last night that has Tony Pauline on it regularly, co-host Fran Duffy talked to the best practice OL award winner at the Senior Bowl Chuma Edoga. He asked him or someone in the room did, because I also heard it on another Senior Bowl recap podcast a few days ago – “who was the best DL you faced in the practices all week?” And he said according to both podcasts, no question it was LJ Collier, he was fast, strong, relentless, and had a variety of moves, was the hardest or almost impossible to stop. Would love to have him and Saunders, who was also unstoppable according to many podcasts and people, including Tony Pauline, that were there at the Senior Bowl practices. Wouldn’t mind as you said, us trading down from #40 or from other spots on the 2nd or 3rd day to acquire more picks. JS seem to have resumed his late pick magic the last couple years with Carson, Moore and Martin, and believe he could do it again with additional 6th and 7th rounders too. Also would like to see us get more picks to draft an extra WR, OL and additional edge or DT. Daylon Mack of Texas A&M was also unstoppable at the Shrine and Senior Bowl practices; wouldn’t mind us double-dipping on the DL with another unstoppable fast run-stopping collapse the pocket DT like Saunders in Mack a couple rounds later, and/or another bendy fast edge rusher like Hollins of Oregon in the 4th-5th or so. But back to the main point, we all love the great quality and quantity you’ve been putting out recently. Just don’t over-exhaust yourself, know you have at least on more job plus a wife and young kids, that’s another full-time job. As long as you can keep it up without detracting from your other job(s) and family, we’re all in favor of these fantastic articles more often. As someone who is not on twitter because of the nonsense your blog is like a sanctuary for me Rob. Each and every piece you write is not a blurting of instantaneous thoughts but rather a collection of well thought out and articulated points on the topic you have chosen. It is so refreshing and logging on with my morning coffee is how I start everyday. I miss the days when newspapers had quality sports writers who actually wrote columns and articles and your blog takes this one step further as the content is even more timely and in depth. Please don’t change your format because that along with the quality of your writing is what makes you and this blog so special! Ditto. I check the site at least five times a day. And if it is possible it would be great if you can fix the problem with delaying of comments before combine. Love the real articles. With real thought out content. I’m over social media, and Twitter reporting. My take: Post these exactly when you are inspired to write them. There is a natural balance to the timing of things – just ask any Seahawks fan. I never miss an article and can read them when it fits my schedule. I visit this site multiple times every single day. I’m not sure if that’s more a reflection of me having a serious problem or that the content is that addicting (likely both). If you published three articles a day I’d read all of them, but I trust you won’t let quantity conflict with quality (and that’s why we’re here). As long as you have something to say, let her rip. Agreed, I visit at least once a day, and enjoy both the articles and comments. Love the other people finding players in the rough. Wow! My first post. I literally look at this site every day and have for 6 years. It is the best football content on the web. I do not have Twitter. You do an awesome job. Keep it up!! Speaking for myself, I find myself checking SDB every day, often several times a day on a slow day at work. I’m always greedy for more analysis and perspective on the Seahawks’ decision making process. Enjoying every bit of it, Rob, can never be too much in my opinion! Appreciate your dedication! Love the content, I check at least once a day for a new article and as well read all the comments from the awesome community you’ve brought in here. If the current pace gets to be too much I’d be fine with article counts closer to 2/3 per week. Especially if you maybe take a more league wide approach on what you see for different prospects. As 1st and foremost a Seahawks fan I certainly enjoy focusing on their roster building, but through the draft process I’ve also started to really enjoy the whole draft and especially where some of the prospects you initially point out relative to the Seahawks go to different teams and follow their careers. I’ve certainly been keeping up with Bolles and Rankins to name a couple examples, who I was initially exposed to here and now am enjoying watching how they are performing, albeit for a different team, at the NFL level. I’d love some articles focusing on particular positional groups and maybe instead of ranking them, just identifying what round range you expect them to go in, highlighting whether or not they fit into Seahawks draft ideas, as well as highlighting strengths and weaknesses based on your analysis. I’ve got a “big board” of sorts started that lists out 10-25 names per position that I’m hearing about to try to get a better idea of what sorts of players might be available later in the draft. Appreciate all your work and would love to hear you podcasting more. Thanks! I’m very happy to continue the current pace, I just wanted to make sure everyone else was. Keep it up. I check this site every morning, and even go back to older articles to read new comments! I stay away from Twitter, but I do peruse several mock draft websites. From them collectively you usually end up with a list of players who the Hawks won’t draft, accompanied by brief, superficial explanations that sometimes don’t make sense. I love reading all of your articles, but please don’t sacrifice quality for quantity. Your pieces are well thought out, logical, and written with skill. Call me old school but I much prefer reading your posts. Check first thing every morning as a matter of fact. To me there is nothing like sitting down to read a good article. I much prefer it than podcasts or any other social media (which I don’t follow anyway). Take a look historically at the number of comments you receive after an article like this versus podcast, that should be a good indicator. Rare poster but love your site Rob. How you churn out the content seems daunting knowing you also have a family. Whatever you decide to do you have a loyal reader here. First off Rob, keep the content coming. Absolutely keep it coming. You have loyal fans here that eat it up. Second, the Hawks have an established record of picking guys in slots that maybe the rest of the league or draft “experts” might not put them in. They rate guys very highly in their own draft board formula that doesnt make sense out of their war room. Carp, Irvin, Pocic Dickson, etc. Grier going in RD2 would meet this too imo. It might be fun post combine to take a stab at something like this. “If the Hawks stay at #21, here are a couple players they could shock the world and draft” type thing. Anyways, thanks for all the great reads! Rob, I’m definitely a long form article kind of guy. I don’t watch enough college football to have a sense of who the Seahawks may be interested in so your work informs me as well and increases my interest at a time when years ago I would tune out and simply wait for post draft analysis. Because of your work I have a much better idea of what Seattle might be trying to do and as a side benefit I recognize so many more players around the league and am interested in their careers because of what I have read here. I do not know how you find the time and energy to keep up this pace as a side pleasure to your job and family but I do greatly appreciate it. Hawks stick with veterans on offense and consider Will Dissly and Jemarco Jones as part of this years rookie class. #21Dexter Lawrence (DT / Clemson) Hawks get an elite run stuffing DT with pass rush upside. Would combine with Reed and Poona Ford to give the Hawks one of the best DT rotations in the NFL and instantly upgrade the run defense. #85 Charles Omenihu (DE / Texas)- Ideal 5 tech IMO with great length. Anxious to see how he tests. Adding him with an improving Green and Martin would give the Hawks lots of flexibility at DE. #125 Jamal Peters (CB/ Miss St) Hawks prototype CB and real physical in run support. #149 Bobby Okereke (LB/Stanford) Looks like a good athlete with great length. LB depth at a minimum is required. R2 (#40) Terry Mclaurin (WR / Ohio St) – He is gone in Rob’s mock but is one of my favorite prospects so I have my fingers crossed he would make it to # 40. R3 (#76) Charles Omenihu (DE / Texas)- Ideal 5 tech IMO with great length. Anxious to see how he tests. Adding him with an improving Green and Martin would give the Hawks lots of flexibility at DE. R3 (#85) Rennell Wren (DT / Ariz St.) – The type of athletic freak the Hawks currently lack at DT. Trust that Hawks coaches can coach him up. R4 (#118) Jamal Peters (CB/ Miss St) Hawks prototype CB and real physical in run support. R4 (#125) Bobby Okereke (LB/Stanford) Looks like a good athlete with great length. LB depth at a minimum is required. R5 (#148)Drew Sample (TE / Wash) Certainly looked the part at Senior Bowl and will team with another Husky Will Dissley and Vannett to give the Hawks (3) young all purpose TE. R5 (#149)Alec Ingold (FB / Wisc)- Agree with Rob the Hawks need a FB and will trust his judgement. I have often been frustrated by the Hawks constant trade backs but I have to admit I think I prefer draft #2. Very nice. Really like both of those, if only we could get all those guys in the same draft. Probably only possible on one of those online draft simulators. A guy I was just watching and really like is Vosean Joseph. Checked him out awhile ago because of a recommendation by V12 but had forgotten about him. Anyone else check this guy out? Haven’t seen him mentioned much here. Runs fast, hits hard. Any mock that has us landing one of the Clemson DL or Polite has my stamp of approval! I wonder what would happen if a genuine blue-chip talent fell to the Seahawks. Every year that they have traded down from the back end of R1, they have stated that they had several guys left on their board with equal grades, and so felt they could move down and still get one of them. Oh well, maybe not the best year to test that scenario given we only have 4 draft picks. P.S. I’m not convinced on Okereke. The freakish length is there, but I didn’t think he was fast enough or aggressive enough in the games I watched. Combine will tell. Still need to watch Terrill Hanks as he seems to be the similar alternative. Like a lot of the other readers on here, I check several times a day to see if there’s new content. Love your writing, Rob… and all your great insight. Keep up the fantastic work! Rob, I’ll echo everyone else, love all the content you’re putting out. Rob, I so do appreciate the long-form pieces you produce as opposed Seahawks Twitter, or such stuff. As to the frequency, follow your heart-any time the spirit moves you, whether a new angle on something from a prior post, some new development or info, I always know it’s going to be something good. Any time there’s a new post, I feel like a kid on Christmas morning. And then there’s the added joy of taking in the many stimulating reactions from the regulars-with all the reason and congeniality they bring to it. Keep it coming, but pace yourself. One more thing, if rather off-topic, I’m just really getting into the monumental work Allan Moore produced on the rich history of his beloved Northampton entitled Jerusalem. My geography is a tad vague. Is that very near you? Do you get into him at all (though god knows how you find the time for a tome like that? I’ve been wondering about Ingold for the last few seasons. He was a pretty highly regarded QB in high school that decided to stay in state and play for the Badgers. Also played LB, which is where I believe Bucky tried him first before ultimately moving him to FB. I’m thinking he’d be great special teams value too. Also had 21 TDs in his 4 seasons, so it’s not like he’s only a blocking FB. Long time lurker here. Adding my voice to those of the others. Love your site. It is the first place I visit online each day, to catch your latest article. I like others, swing by several times during the day to read the follow up comments. You provide the most cogent, reasonable and well thought out analysis of the Seahawks and their team needs. You promote respectful debate and explore all sides of an issue. There is no better site on the web. Thanks to you for making it available and for taking the time to keep fresh content coming. Thanks also to all of the more active commentators on the site. 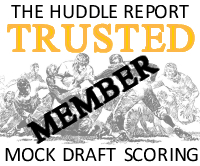 Your thoughtful mock drafts and comments also add great value to the site. Saunders is a beast. Only concern being he’s another “sawed off” interior DL and we already have ole Poona and the hawks love length at DL as you mentioned. I like these interior guys able to keep themselves clean with length and able to stack and shed blocks. & length helps with disrupting passing lanes and batting down passes. I can just imagine Brady, Rivers; or worse, Goff, Garoppolo throwing right over the heads of Saunders & Poona. Getting the ball out quick, dinking & dunking up the middle of the field. Still, he’s worth a shot in the middle rounds. No one is complaining about Aaron Donald’s length. It looks likely that the Hawks are going to lose Thomas, Davis, Wright and Coleman this year – if not a few more. If they lay low in free agency that could change the picture. I am not sure how the whole comp pick system work but I’d like to learn more about this possibility. Really like this mock and think it reflects the type of draft class we are likely going to get this year: solid all around, not necessarily spectacular. Great point as well about the FB and TE being guys who could likely contribute right away. There’s value in that with so few players on the roster. As for your content, I would just not want you to feel pressured in any way to put out more content than you can comfortably manage. That said, I’ll take as much as you’d like to put out, especially during draft season! And thank you for asking our opinion. I do agree that some of the articles are nice to let simmer for a couple days, or as long as the discussion is still going strong in the comments. Big pieces like your mock drafts, Seahawks mocks, the RW article, etc. fit that category. Obviously during Senior Bowl, Combine, etc. it’s more of a daily coverage, and that works great. But some of the pieces I enjoy the most are the ones where you simply post your notes on a game tape of a couple prospects that you have been watching recently. Just embedding the video and writing the things to notice at different time stamps of the video. It helps me to see things I hadn’t noticed, look at players I haven’t seen, learn to scout different positions, and judge why a certain prospect might (or might not) appeal to the Hawks. If the screen capturing would take too much time, then you could just post the YT video and notes on plays in thread below it as you go. I’ll just finish this long-winded comment with another big thank you for creating this amazing place. Can’t be said enough IMO. Long time reader, twitter follower … I really enjoy your work and perspective on Seahawks fandom. I read everything you write here and come back to read the comments because I appreciate that you respond with thought rather than the a dismissive, superior attitude. I like that you present as opinion, not fact, and recognize that other opinions aren’t always stupid. I just hope you keep writing the longer, more thoughtful articles instead of twitter comments and you write as long as it keeps you happy and not get burnt out. I’d rather have less content, but on topics that you enjoy writing about than trying to hit a certain number of posts per week. lurker here…i check everyday because of the frequency of new content. QUALITY content at that and it comes at the perfect time because i don’t want to take a break between the end of the season to draft day in keeping up with the hawks. the more we get here, the less i check twitter and reddit so from the bottom of my heart, thank you. May-July and now is a terribly boring time for us draft nerds. I feel like this time of year is ok because you’ve got Shrine/Senior Bowl, the amount of draft coverage really starts to pick up and then you’ve got free agency and the Combine. Once the Combine is done though, oof, it feels like you’re so up and excited for the draft and then it takes forever with only pro days to satiate with new content until the draft actually comes. Then after the draft I essentially stop paying attention until training camp/preseason. Rob I like that you are thinking outside the box in drafting a QB early. I know that I have been surprised several times by the way the Hawks draft. My question is why not just resign Brett Hundley who you gave up a seventh round pick for and let him compete with Paxton Lynch? Both are relatively young. You have limited draft stock, I don’t see them investing a high pick on a QB. Is this a SR bowl only mock or something? Peters wasn’t at the Senior Bowl. But yes, as noted, it’s a reflection post-Mobile. I thought so. I must’ve skimmed through where it said it was. Guess I should read better. Read every article and 75% of comments since the Curry draft ( I was a Crabtree guy) Oh well no real loss there. I wouldn’t change a thing, also enjoy reading the comments as there is a lot of great input and good opinions there as well. Listen to some of the podcast but not all. Ha! I was really hoping for Crabtree too. Maybe having a blog isn’t whats hot right now, but as a die-hard wrestling fan, I’m tired of listening to every white guy under the sun with a podcast either big mad or sounding like AM radio. And draft podcasts probably don’t fall under the former, but boy oh boy do they meet the criteria of the latter. I think fans of any type of entertainment want different and that’s what this place is. I’m probably sounding like an old man yelling at the sun or yelling at kids to get off his lawn, but this blog reminds me of a simpler time when you could go to forums or boards, interact, and feel like part of something. For me, that’s why I gravitate towards here. Twitter is a lot like that but it’s just so damn toxic. Opinions become facts. As Sea Mode said, I hope you don’t get burned out. Never change though man. My only issue is the lag between posts. Are there any players in this years draft that you think Seattle will target or fit the profile to convert from OLB to SS? What are you thoughts on Nate Hall from Northwestern as a possible convert to SS? If he added a little weight he could be a KJ mirror replacement but where he is physically now definitely a Kam replacement. I love this guy and hope he’s on Seattle’s board. Any thoughts on him? Also any thoughts on Chase Hansen from Utah at SS and an obscure player as a convert to SS Bryan London II from Texas St., definitely UDFA potential. I kinda think some teams will see Ben Burr-Kiven as one. Thank you for Last article I always enjoy reading your material I can assure you that I read it every day. I really enjoy the draft and your comments .even though I don’t believe the Seahawks will be very active in free agency I was wondering if you thought about if the Seahawks brought back Jermaine kearse .it could be possibility. I think Seattle trying to trade back and accumulate picks is gonna be much, much harder this year. I like the fact this mock has 7 picks instead of the 10-11 I normally see. That’d be great, but IMO 6 or 7 picks is what Seattle will likely come away from this draft with. Unfortunately you can’t fill every hole you may currently have. Now. This is a team that’s historically drafted a year in advance. Look at RB this year. One maybe two will go top 50. Seattle took Penny for many reasons, but this is probably one as well. Loaded D-line class. Prototype, traditional 4-3 ends? Not so much. Rasheem Green was added last year. Knew that they would need some LB depth after the 2018 season, draft Shaquem Griffin who I think they probably have bigger plans for than we realize. So, there will be a pick or two they make that won’t see much playing time or have immediate benefits. What are some positions every one thinks they’ll target this year with 2020 in mind? Probably wr in an attempt to prepare for life without Baldwin. Maybe a Te to pair with dissly or as Rob pointed out they could go qb preparing for Wilson’s contract. WR- Baldwin was banged up all year and their have been rumors of retirement. When he’s out, Lockett is our only weapon. OT- Ifedi. They do have the 5th year option, but it won’t be cheap and they’ll have to decide if he’s good enough to hand a good chunk of change. TE- Vannett. How much does he really add over a cheap rookie, especially since there appear to be several Y’s in this class? DT- There are enough to go around this year, don’t fight the strength of the draft, and hedge yourselves for Reed negotiations. WR, O-line, and safety would be mine. WR, OT, QB, TE, maybe a MLB. Although I think a WR would have a bigger role than the others in 2019. Aside from pass rush and a playmaking WR, I think this draft will be BPA and trying to hit the sweet spots on positional cliffs like last year to fill depth. If they’re at 35 and the value at DL still has life, they’ll likely prefer to target another position that is about to have a talent dropoff. Could be any of those positions, maybe even a Guard if we dont keep Sweezy and Fluker. Free agency should be yuge brother. What an awful interview for Murray. Will he be at combine? Yeah, have no idea what that was all about. Yikes. Heard on 710 a couple weeks back that there is some noise he isn’t a great teammate or locker room guy or something like that. That interview doesn’t sound like a guy that is “all ball”. That’s two strikes against him for me (the first is size), talent is just one part of the equation. Best to focus on what a guy can do rather than what he cant. Maybe he can’t interview well. Doesnt mean he’s uncoachable or cant be the face of the franchise. Agreed man. He’s going to be a pro ball player, not a professional interviewer. And he can ball. I’ve got some empathy for everyone but I don’t feel sorry for the guy because he’s got options. His tough decision isn’t a good excuse (to me) for that terrible interview. Might not have hurt his stock but sure couldn’t have helped it. Maybe it helps him fall to the hawks. He would be fun to watch in preseason and be good Russ insurance in the case of injury or a contract dispute. Super awkward. He needs better guidance from his agent. Not sure that it will ultimately affect his stock but it’s not a good look for teams wanting a confident QB. I couldn’t believe how terrible it was either. Wow. Maybe it is a calculated move, to try not to be picked by the Cardinals (where QBs go to die) or a few other really horrid teams high in the draft. He needs a ready made team around him so he can “RW it” the first 2 years. Though, Jacksonville would be a mighty intriguing landing spot for him. He’s got an image to uphold, but he came across lame AF there. Can’t make the same mistake his dad did hence the questions from DP to him. It was quite cringe worthy on the Dan Patrick Show and slightly less cringy with Rich Eisen. Maybe he’s got social anxiety, doesn’t like small talk, or feels he has more productive things to do. Maybe he’s still undecided about baseball or football. Maybe he’s socially awkward. Perhaps he thought they were going to bait him into something and he was guarded about the whole thing. It’s not a good look. Optics matter quite a bit. Combine interviews are going to be make or break for him getting that first round money. I actually feel sorry for him having watched it a second time. From that I think it’s pretty clear he’s undecided on what to do and perhaps has declared just to buy himself more time. And if he hasn’t decided yet he’s probably genuinely torn. I can’t imagine what it must be like… faced with a decision with millions of dollars at stake, knowing you’re essentially picking what you’ll forever be remembered for. I think we should cut him some slack. Agreed Rob. The guy is 21 years old. When I was 21 I was pretty awkward and definitely not nearly as mature as I am now. A lot to process for a young man, and a whole lot of voices at that age telling you who you ought to be and what you ought to do. Is he still an option for the Hawks? I’d say yes if he lasts to the second round. Wayyyy better interview with Prime Time. Sanders thinks he’s going to play football. I agree. Rob, totally agree. Hard to not call it one of the worst predraft interviews I’ve ever seen but on the same token there hasn’t really ever been such a highly coveted two sport prospect in recent memory. Sure the occasional QB goes in the third for some development team once in a while, but to be so highly coveted by such vastly different systems/industries….. The only thing this says to me is that his current team isnt doing enough to prepare him for this journey, something I don’t think NFL teams will much worry about. If the biggest knock on him is a lack of preparation for the draft process I absolutely begrudge him nothing. Just came off a long playoff season during which he had been generally tabbed to be a baseball player. Bet he aces his team interviews w/ no cameras and mikes. Didn’t think he came off as a horrible prick, by any stretch. Just.. really, really awkward, and I gotta say, it sort of brings home the issue that I fear about Murray that makes me pump the breaks a bit. Ironically, it’s about his baseball situation. All throughout RW’s tenure in Seattle, the one single thing that has always bugged me most about him, is the occasional notion that he would seemingly attempt to use baseball as leverage. Nobody really took that seriously because he was a significantly better football player than a baseball player. Murray is a legit baseball prospect, and he would be in position to constantly use baseball as leverage. I feel like that was essentially happening in this interview and it looked really terrible. It feels like he isn’t even drafted yet, and this is seeping through the cracks. That’s what I took away from this, anyhoos. That’s exactly what his dad did but the other way around. Was blackballed/political hit from the NFL. I go back to what I thought a couple threads ago, I don’t think he is mature enough and have the IT factor I would want from a number 1 QB or face of my team. I don’t question his talent or athleticism, but I just don’t see a leader, or someone a team can get behind day 1. I understand he is 21 and agree with the fact I wasn’t there at 21, or have this big of a decision. But if I’m a Gm, I’m looking at someone to take and be my QB, he better be A LOT different than I was at 21. We have other players that age acting way more mature, and respectful. This came off very disrespectful to me. I need someone that’s also decisive. This is a huge decision, no doubt, but if he hasn’t made the decision by now, and doesn’t want to commit to even the combine or pro-day, I’m really concerned about drafting him. We talk about players like tillery and question his “all ball” mentality because he has aspirations and dreams outside football in business and hobbies, then this from Murray should sure as he’ll be a concern for teams, and him not even being able to make the slightest commitment to even prepare for the draft. Also why I would question drafting him high, and question taking any QB high in this draft. His dad is giving him some poor advice, as I believe that is where this is coming from, and not his agent. His agent probably is pushing for baseball anyways. I think this is a bit unfair. How many of us need to pick between two sports and millions of dollars with a deadline — and then get thrown out to the media by Gatorade when you haven’t made your choice? It’s a horrible situation. Did he handle it well? No. Is it indicative of his ability to be a fantastic franchise quarterback? Not at all. I really enjoy the more frequent content, especially at this time of year. I’m also a huge podcast guy, and would love to see you do more in that realm and/or video breakdowns etc. One thing that I do think about is how difficult it is to have good conversations in the comment section. It’s like, I see an article and reply to a Comment 50, then by the time I leave my own it’s Comment 100. Then I check back in an hour or two later and there are over 200 comments, and I have to scroll through to see if someone replied to my reply to Comment 50, then scroll more to see if anyone replied to my commment st 100, then etc. Especially on mobile it’s a huge pain. I agree it would be nice to somehow filter the comments to where you can easily find replies to your comments. Maybe someone on here with a computer science degree can help Rob’s site with that. IDK about all that, but I hope his indecision doesn’t kill his career like it did his dads. Is Murray a better passer than Wilson was coming out of college? I’m wondering how they compare to each other. For sure naw. The college game is slightly different now but Russ had a very very polished deep ball. I kick myself over and over for just completely writing him off based on his height and the narrative around it. In hindsight, Wilson was exceptionally well prepared to come from college to the next level. We don’t know about Murray yet, but it wouldn’t be surprising if he is not as well prepared. Not many are. We see the talent but we don’t really know how he will perform on the big stage. Will he be a star or will he be the Spud Webb of the NFL? (No offense intended). Do you guys think he’d be be good at track and field? In the olden days, he would be considered to tall for a sprinter, due to his long strides. All I can say is, he could have put the 100 meter world record out of reach for another generation, if he had not pulled up in the Olympics with 10 meters to go.. shaving another 0.1s or possibly 0.2 s off the ultimate finishing time…. which was still a world record. He maybe one of the most impressive modern track and field sprinters….. period. I would love, love, love to do that but I suspect Brock would be too busy plus it’d be a far bigger commitment for him doing a podcast with a British dude he’s never met vs me being able to share a platform with an established ESPN host and analyst. I appreciate the suggestion though. I intend to do a podcast which involves speaking to various experts and I will send Brock a tweet to see if he could spare 15 minutes. Brock does a podcast about faith and sports every few weeks. Just butter him up and say UW has some great prospects this year… he will bite. Rob, I’m usually in agreement with the vast majorities of your assessments, but I really disagree with your assessment of Paris Campbell. Sure he fits a certain role well, but he’s not even a mid-tier WR. The only real routes he runs are RB routes (flares, angles, option) and WR screens–most of the time just following 1st class blocking by fellow WRs. The Percy Harvin comparisons are good, although you mention he doesnt have the same wiggle and shake, which I agree with. But there’s a reason Harvin went to so many teams. His upside as a runner is hard to deploy consistently in games. If Campbell was a real RB and had value as a runner, then all the sudden the skills he possesses as a WR are extremely valuable because his versatility can stretch defenses, both schemes and personnel. but as a WR only he is very limited. The few routes he does run he gets very little separation against man coverage, and when he catches balls on the run thrown with velocity he relies on body catches almost exclusively. The few routes he wins on are over the middle against linebackers, many of whom are overmatched and won’t see at the next level. I don’t think that the Seahawks want any part of a RB/WR conversion project after striking out with CJ procise (there is a reason he was converted from WR) and having difficulty with Percy Harvin in the every day offense. You can’t afford that type of risk and limited upside with a high to mid pick. Overall, I think Cambell is overrated and McGlaughlin is incredibly underrated. I have him as a top 3 WR in this draft.